During the French Indo China war 1947-1954 French forced were equipped with U.S. M1 helmets. 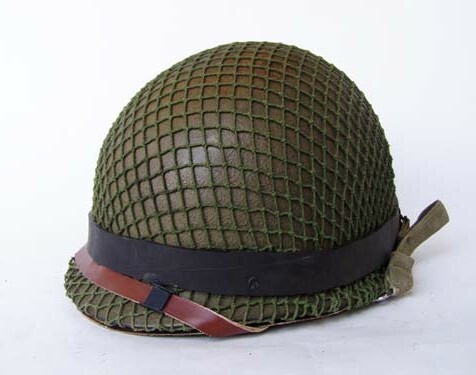 This helmet has been restored to reflect a typical mixture of WWII surplus and early 1950s issue. 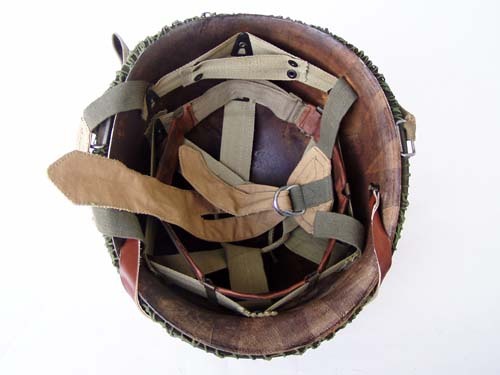 The helmet is a U.S. front seam swivel bail that still maintains its late WWII cork finish. The liner is a 1950/51 Micarta with black parkerized hardware and the additional French rigger added cloth chinstrap with nickel plated steel D rings. The helmet has been fit with a late WWII net (sourced from Vietnam) secured by the addition of a black rubber inner tube (Michelin naturally) as was the French practice in Indochina. If you have ever wanted the helmet that was worn by the French forces that jumped into Dien Bien Phu, this is it.